Cherries are among the best antioxidant-rich foods you should be eating more right now. Besides having powerful antioxidants, cherries are chock-full of fiber, potassium, copper, magnesium, as well as manganese, iron, calcium, zinc and phosphorus. Be they frozen, dry or canned, you can enjoy cherries and their health benefits all year long. But now that the cherry season is here, it’s hard (particularly for me) to find an excuse not to munch on a handful of cherries today. Check out some of the best health benefits of cherries and try out my favorite dairy-free cherry smoothie recipe. Since I have some heart problems, I’m always on the lookout for new foods that help support my heart health. I did a lot of research on heart-healthy foods and read plenty of studies so I know what to eat to improve my heart health. A few days ago I had my heart checkup and my doctor recommended me to eat more cherries. I did one more research and found out that cherries are a wonderful source of anthocyanins and potassium, which help regulate blood pressure and heart rate and lower the risk of hypertension and stroke. Cherries are also rich in phytosterols that help lower bad cholesterol levels. Heart disease is still a number one killer of Americans and other people worldwide so adding some cherries to your desserts, salads and drinks can help you feel a bit healthier. If you watch your blood-sugar levels, it may be hard for you to find a healthy snack that has a low glycemic index. Cherries are perfect for snack time as they have a lower glycemic index (22) than blueberries, apricots, grapes, and peaches. Add a handful of cherries to a plain yogurt and voila – you have a healthy and tasty snack in a jiffy. No worries, eating cherries during the day won’t make you sleepy. If you have trouble falling asleep or getting quality sleep, however, I recommend you to include some cherries in your bedtime snacks. Cherries are high in melatonin that helps regulate sleep cycle and prevents insomnia. Many doctors recommend drinking cherry juice too. Moreover, if you are trying to cope with jet lag, cherries may become your little best friends. 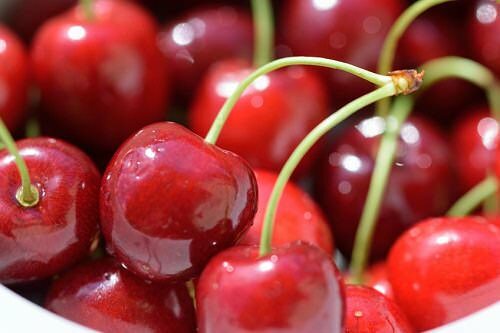 Eating cherries won’t help people suffering from chronic insomnia – you should visit your doctor as soon as possible if you are one of them. As many other fruit, cherries contain powerful antioxidants that can save your brain from dementia and Alzheimer’s disease. Cherries boast fantastic memory boosting properties, which makes them perfect snack for students and super busy people. Next time you can’t accomplish that difficult project, sip your favorite cherry smoothie to give your brain a boost. While you’re always better off eating bananas, cherries can also help you relieve muscle or menstrual cramps. Cherries have a lower potassium content than bananas, but they also have lower calorie content, which is why many dietitians recommends eating cherries before or after workout to relieve muscle cramps and burn more calories. If you need to relieve menstrual cramps, cherry juice may help. In a fast-food-rich world, it’s almost impossible to keep the digestive system healthy. Many people often say that it’s hard to overcome those annoying sugar cravings and stick to a healthy diet. Every woman is afraid of premature aging yet many do nothing to prevent it. There are two tried and true ways to look and feel young for longer. The first one is to cultivate a positive attitude and smile more, and the second one is to eat more age-fighting foods like cherries. Due to high antioxidant content, cherries help your body combat the free radicals that cause premature aging. There’s no cure for cancer but eating antioxidant-rich fruit and berries, including cherries, can significantly reduce your risk of cancer. Several studies show that eating cherries or drinking cherry juice regularly can prevent colon cancer. Sure, it doesn’t mean you should munch on cherries all day and night long to stay healthier and live longer – a handful will be enough to feel all the health benefits cherries offer. Cherries are low in calories and high in nutrients. They are delis, versatile and healthy. Whether you love these tiny berries or not, there are many ways you can incorporate cherries into your spring or summer diet to reap all their health benefits and ward off a number of serious diseases. Are you one of those cherry fans who enjoy cherries daily? 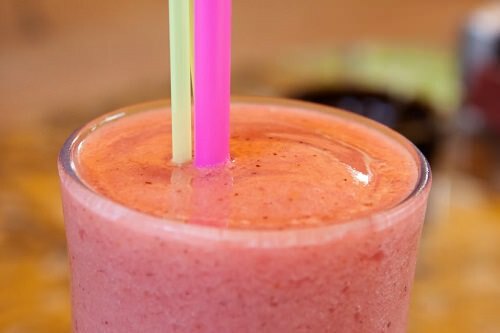 Let me know what you think of this refreshing smoothie recipe. Put all the ingredients into a blender and blend until smooth. If your smoothie is too thick, you can add a bit more coconut water. Enjoy!